DOL's NAWS data suggest that there are fewer foreign-born crop workers employed in US agriculture and fewer newcomers among them. 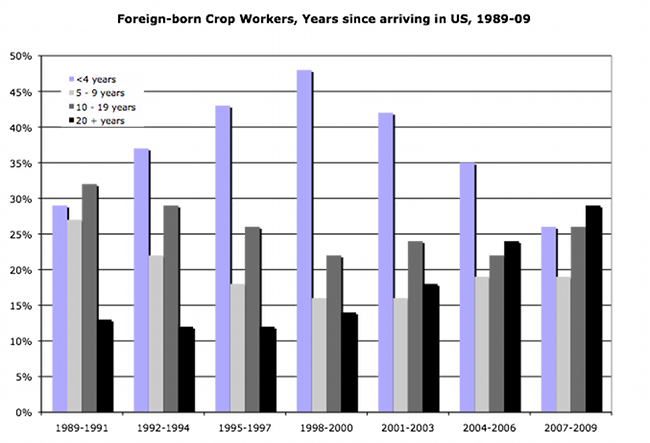 Between 2007 and 2009, about 70 percent of crop workers were foreign born, but only a quarter were in the US less than four years, down from half a decade earlier. NAWS data also show rising hourly earnings and more weeks of farm work, perhaps because of fewer new arrivals and/or because farm employers perceive productivity and other advantages with less worker turnover, including not having to complete immigration forms on new hires.